The AVO250 series eighth-brick isolated DC-DC converter provides a single regulated low noise 28 Vdc output. 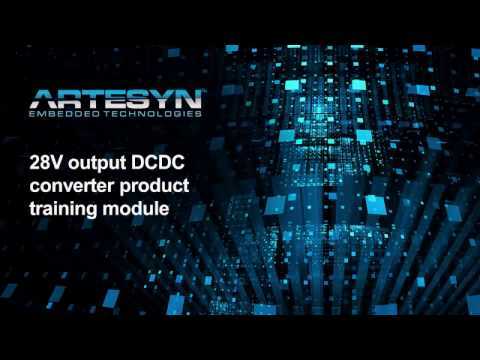 The converter has a wide 2:1 input range of 36 to 75 Vdc and is designed primarily for use with standard 48 V telecommunications equipment supplies. Rated at 250 watts, it can deliver up to 9 amps and accommodates an ambient operating temperature range of -40 to 85˚C. The converter has a typical efficiency of 93% and accommodates an ambient operating temperature range of -40 to 85˚C. Its design is optimized for conduction cooling with an aluminum baseplate option for enhanced thermal performance and thermal transfer. The conversion technology employs 150 kHz fixed frequency switching to help minimize external EMI filtering requirements. Standard features include output trim, remote enable, undervoltage lockout and differential remote sense, with non-latching overvoltage and overtemperature protection. AVO250 series converters have an installed height of just 0.5 inch (12.7 mm), making them ideal for systems with demanding inter-board spacing requirements. 2.300" x 0.900" x 0.500"